McGraw-Hill/Irwin PPT Module 12 Persuasive Messages ©2007, The McGraw-Hill Companies, All Rights Reserved. 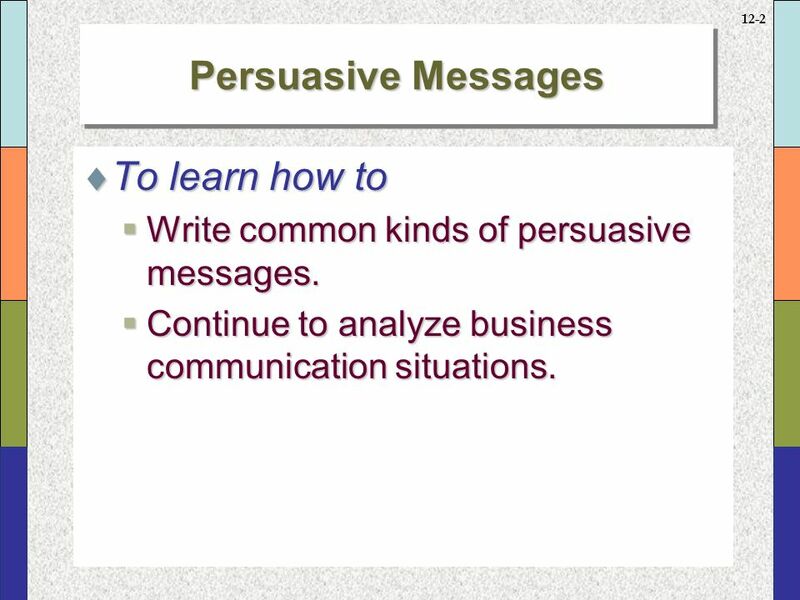 1 McGraw-Hill/Irwin PPT Module 12 Persuasive Messages ©2007, The McGraw-Hill Companies, All Rights Reserved. 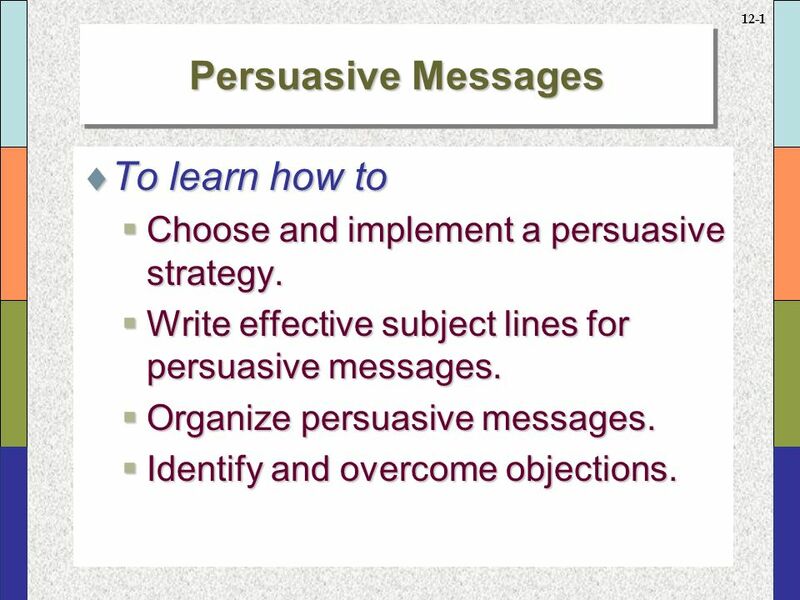 2 12-1 Persuasive Messages  To learn how to  Choose and implement a persuasive strategy.  Write effective subject lines for persuasive messages.  Organize persuasive messages.  Identify and overcome objections. 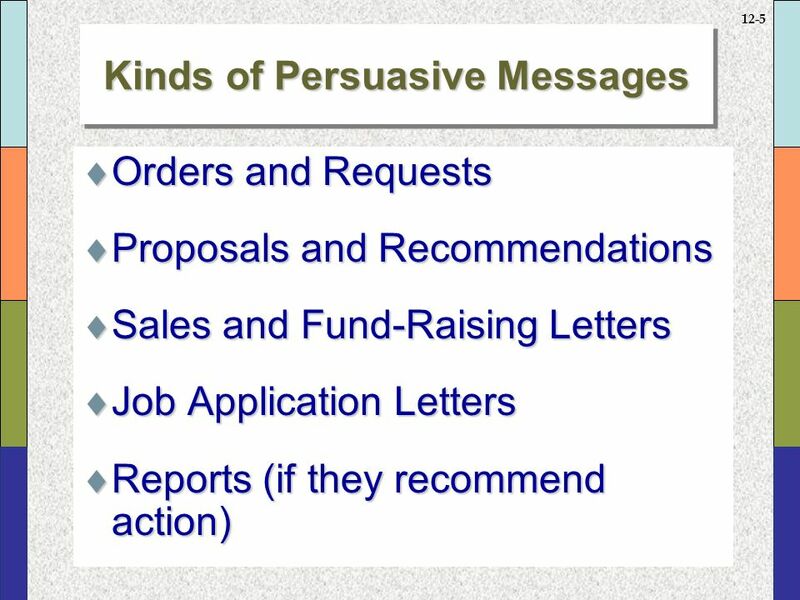 3 12-2 Persuasive Messages  To learn how to  Write common kinds of persuasive messages.  Continue to analyze business communication situations. 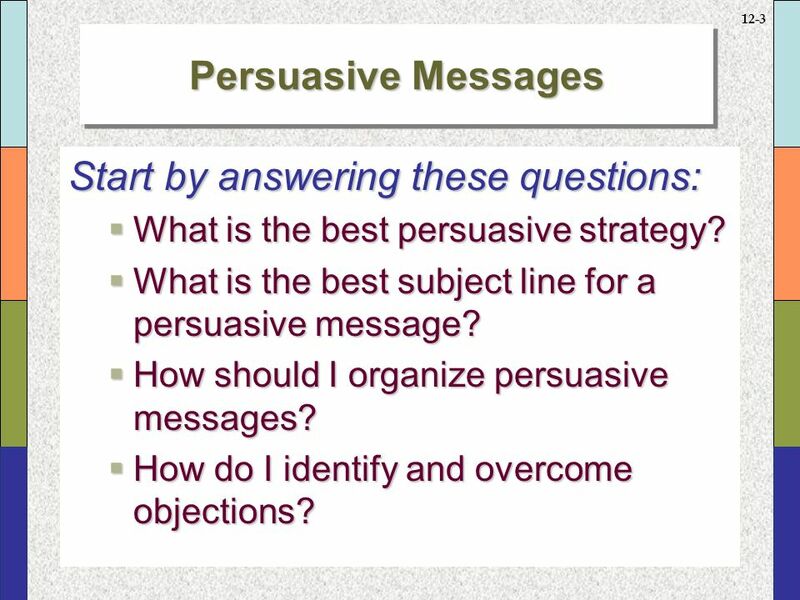 4 12-3 Persuasive Messages Start by answering these questions:  What is the best persuasive strategy?  What is the best subject line for a persuasive message?  How should I organize persuasive messages?  How do I identify and overcome objections? 5 12-4 Persuasive Messages Start by answering these questions:  What other techniques can make my messages more persuasive?  What are the most common kinds of persuasive messages? 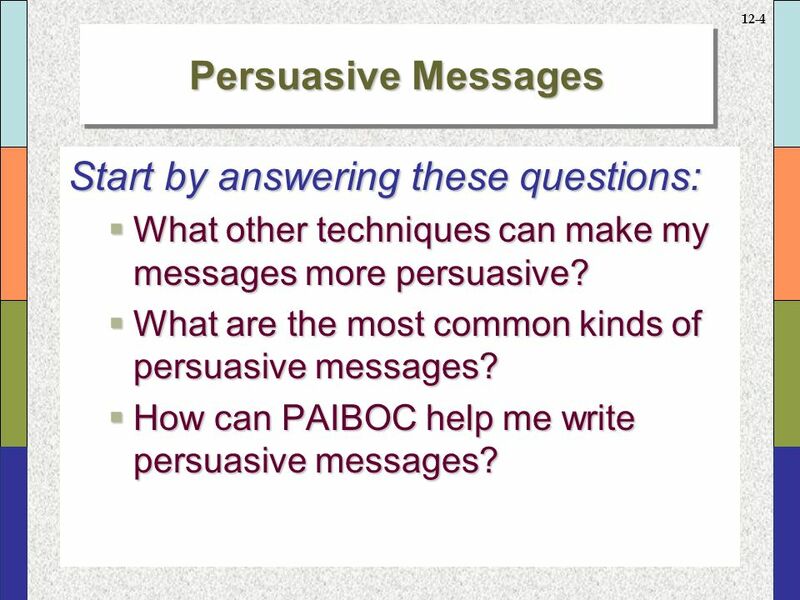  How can PAIBOC help me write persuasive messages? 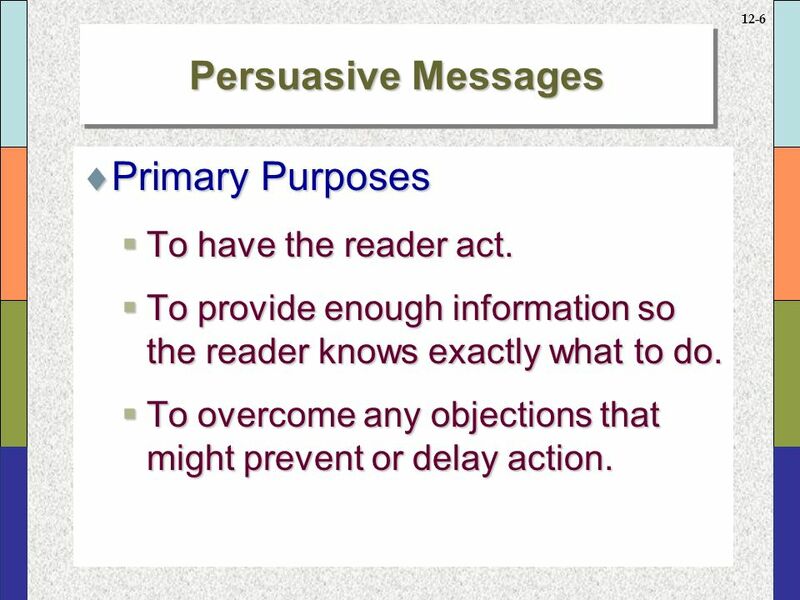 7 12-6 Persuasive Messages  Primary Purposes  To have the reader act.  To provide enough information so the reader knows exactly what to do.  To overcome any objections that might prevent or delay action. 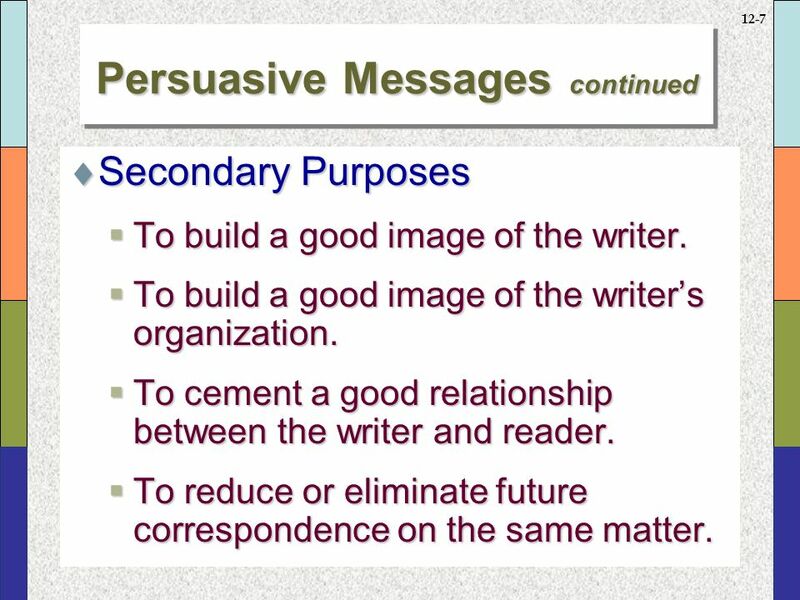 8 12-7 Persuasive Messages continued  Secondary Purposes  To build a good image of the writer.  To build a good image of the writer’s organization.  To cement a good relationship between the writer and reader.  To reduce or eliminate future correspondence on the same matter. 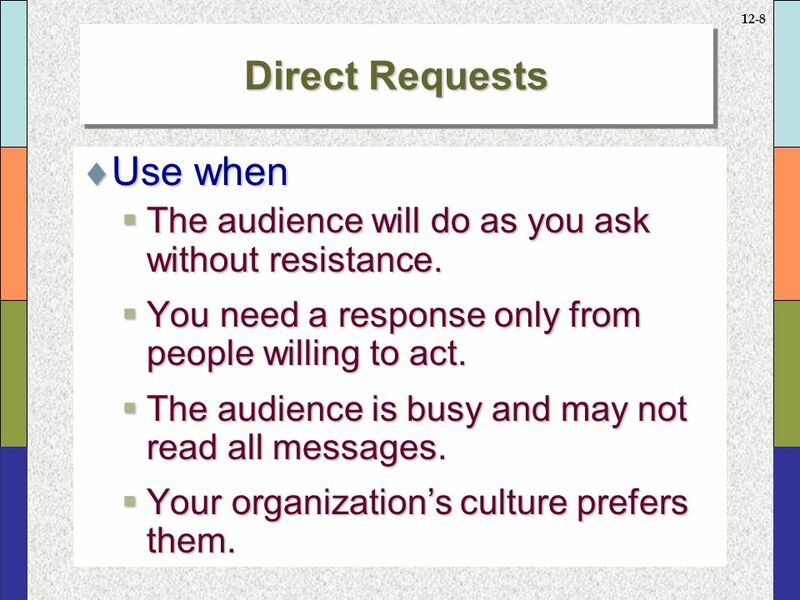 9 12-8 Direct Requests  Use when  The audience will do as you ask without resistance.  You need a response only from people willing to act.  The audience is busy and may not read all messages.  Your organization’s culture prefers them. 10 12-9 Direct Requests continued  Follow this pattern.  Consider asking immediately for the information or service you want. 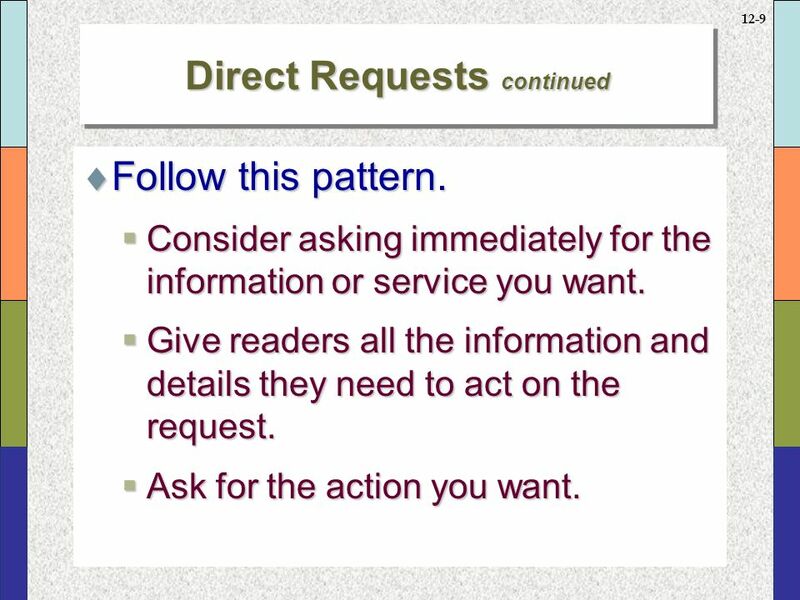  Give readers all the information and details they need to act on the request.  Ask for the action you want. 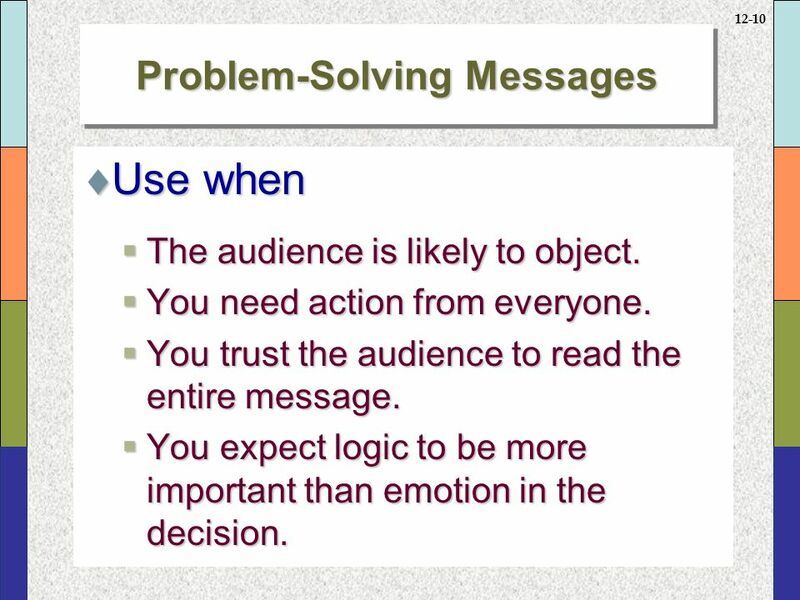 11 12-10 Problem-Solving Messages  Use when  The audience is likely to object.  You need action from everyone.  You trust the audience to read the entire message.  You expect logic to be more important than emotion in the decision. 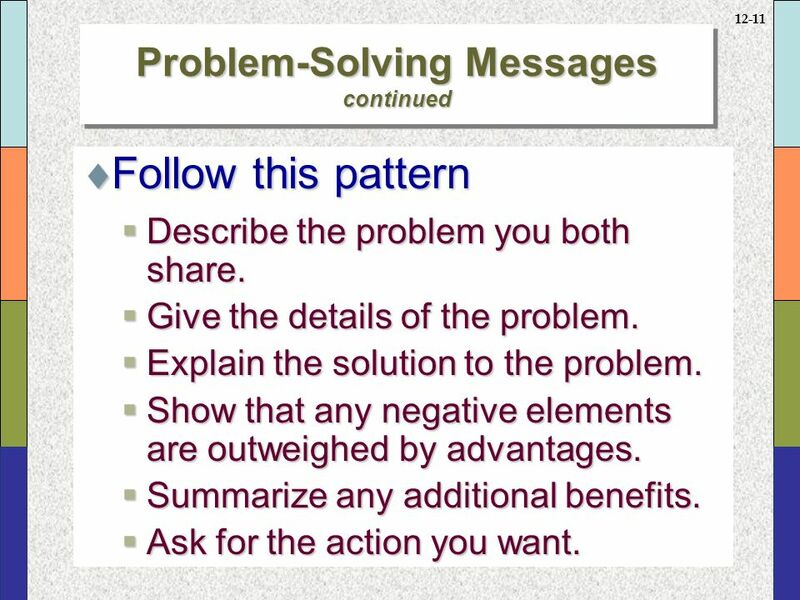 12 12-11 Problem-Solving Messages continued  Follow this pattern  Describe the problem you both share.  Give the details of the problem.  Explain the solution to the problem.  Show that any negative elements are outweighed by advantages.  Summarize any additional benefits.  Ask for the action you want. 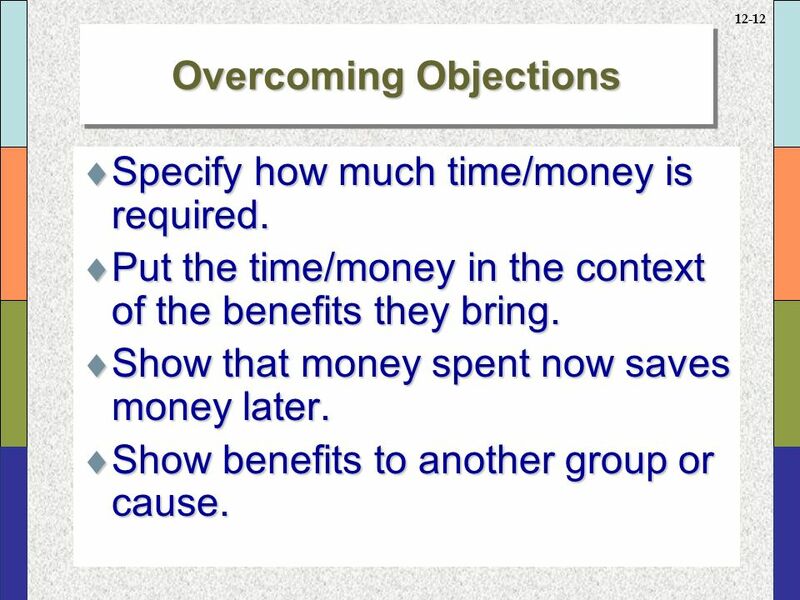 13 12-12 Overcoming Objections  Specify how much time/money is required.  Put the time/money in the context of the benefits they bring.  Show that money spent now saves money later.  Show benefits to another group or cause. 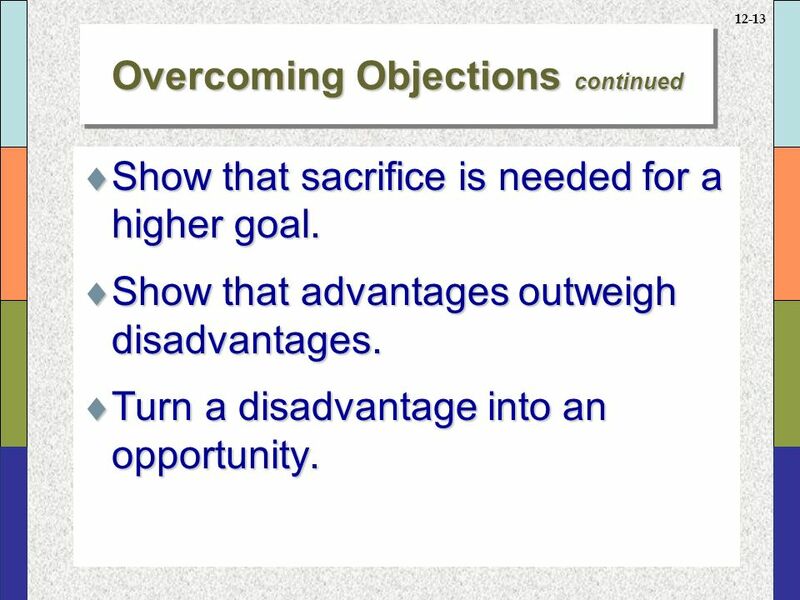 14 12-13 Overcoming Objections continued  Show that sacrifice is needed for a higher goal.  Show that advantages outweigh disadvantages.  Turn a disadvantage into an opportunity. 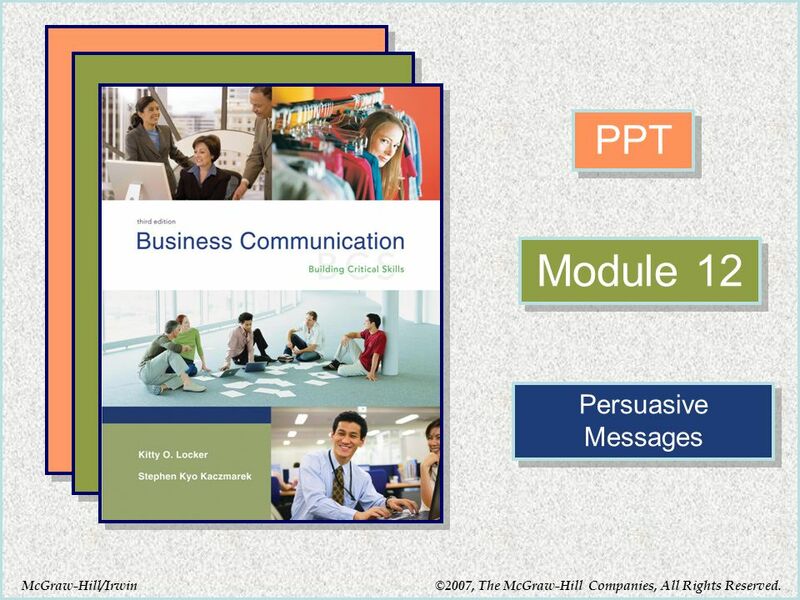 Download ppt "McGraw-Hill/Irwin PPT Module 12 Persuasive Messages ©2007, The McGraw-Hill Companies, All Rights Reserved." Workplace Writing Planning an Appropriate Writing Strategy: The Rhetorical Situation. Routine Letters Have you ever written a letter to a company? Did you expect a response? If you receive a fan letter complimenting your services, do you. McGraw-Hill/Irwin © 2009 The McGraw-Hill Companies, All Rights Reserved Copyright © 2010 by The McGraw-Hill Companies, Inc. All rights reserved. McGraw-Hill/Irwin. Copyright © 2003 by The McGraw-Hill Companies, Inc. All rights reserved. Business and Administrative Communication SIXTH EDITION. Chapter 2 The Marketing Research Process and Proposals Copyright © 2013 by The McGraw-Hill Companies, Inc. All rights reserved. McGraw-Hill/Irwin. You-Attitude To learn how to Begin building goodwill. ©2014 The McGraw-Hill Companies, Inc. All rights reserved Negative Messages Module Eleven Copyright © 2014 by The McGraw-Hill Companies, Inc. All rights. ©2007 McGraw-Hill Ryerson Limited. All rights reserved. MODULE 12 Negative Messages. Business Writing Overview. Barriers to Communication  Verbal Barriers Inadequate knowledge or vocabulary Differences in interpretation Language differences. After Reading KEY TRAITS Writing Workshop Persuasive Essay...continued 1.IDEAS 2. ORGANIZATION Presents a thesis statement taking a position on a clearly. Copyright © 2011 Pearson Education, Inc. publishing as Prentice HallChapter Planning Reports and Proposals.